A designed and commissioned ventilation system is required in all certified Home Performance Index homes. We spend 90% of our time indoors and we need to be sure that the internal air is healthy. A build up of a heavy gas like carbon dioxide affects the little people first, as it sinks to the floor, reducing their cognitive functions and ability to learn. In fact without ventilation in an airtight home we can quickly get a toxic soup of radon, water vapour, Volatile organic compounds, odours and other nasties. We are not good at opening windows in Ireland. Homes are becoming more and more airtight as standards of workmanship improve. It is still permitted under current building regulations Part F technical guidance document, to use trickle vents or a ‘hole in the wall’ as background ventilation. If the airtightness is better than a certain value the area of these vents need to be increased by 40% defeating the purpose of the airtightness. It may still be allowed in the building regulations but that does not make it good practice. For starters the uncomfortable drafts from the trickle vents or hole is wall leads occupiers to block up the ventilation meaning they are living in a sealed box and this first manifests itself as excessive condensation and mould growth. Sometimes home buyers and even some professionals find it hard to understand, why they should go to the bother of having a very air tight building and a ventilation system when you could just build a leaky building and skip the ventilation system. However air tightness is one of the best indicators of the build quality and should be entirely separate issue to ventilation. Relying on leakiness for ventilation is bad practice as you can’t design bad workmanship. It also means uncontrolled means for air to come in, and for moist internal air to leave the building. In fact in a leaky building moist air could be condensing in the fabric of the house as it passes from the warm to the cold side of the structure, storing up future problems. The solution is Build tight ventilate right! At the higher end we have Heat Recovery Ventilation, but there are also much cheaper and very effective solutions such as Demand Controlled Ventilation (DCV). However it is not enough to install the ventilation system, it needs to be tested to check that it is actually working which is why we also require commissioning certificates. That is why we made this little video to explain air tightness and ventilation. New homes that have been certified with the new Home Performance Index (HPI) give homebuyers and planning authorities a unique assurance, that the home has really been designed with care. Did you know that there is a 60% chance that a new home will be occupied by a person with some form of disability at some stage? HPI encourages the designer to consider this from the early stages of designing the home. Embracing flexibility in design is known as Universal Design. We provide Universal Design checklists for the designer to consider at the design stage, issues such as clever use of limited space designed for multi-purposes. This works for young families who need ease of movement for strollers,for children’s play areas, or for extra storage or shelving space, and it also works for wheelchairs and double buggies. It is also important to consider in the approach to the home, such as easy, safe, access from the immediate neighbourhood to the entrance to the home. What is a Universally Designed house? Universal Design is the design of a house, so that it can be accessed, understood and used to the greatest extent possible by all people regardless of their age, size, ability or disability. This is not a special requirement, for the benefit of only a minority of the population. It is a fundamental condition of good design. When an environment is accessible, usable and a pleasure to use, everyone benefits. We are lucky in Ireland to have the Irish Centre for Excellence for Universal Design. 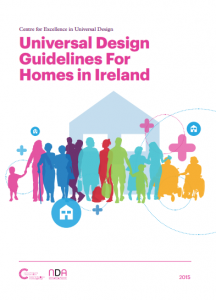 The Centre has recently published the Universal Design Guidelines for Homes in Ireland as a first step in the process of raising awareness about Universal Design. Their aim is to inspire people to think differently about the benefits of Universally Designed homes and the potential opportunity to address some of the global challenges society faces.We were delighted to work with them in the development of the Home Performance Index to include Universal Design. Find out more about these guidelines that will enhance the quality of life for everyone in their homes here. Focus on Skills for Quality. We place a lot of emphasis in the Home Performance Index on skills. You simply cannot get quality low energy homes if the designers and construction staff on the project are not skilled to deliver. That is why the Irish Green Building Council teamed up with Limerick, Dublin and Blanchardstown Institutes of technology to develop accredited Foundation Energy Skills courses for construction workers. We also set up the Construction Workers Skills Register in 2016 as the place for home builders to find the right staff and sub contractors. In the Home Performance Index we require the home builder to on the CIRI register, this ensures that at least the main contractor is required to upskill. Beyond this we measure the contractor by their commitment to upskilling the construction workers on the site. This applies not only to the home builder, but to the subcontractors. Not much use having a great team, if the window sub contractor does not install the windows properly, or the electrician and plumber don’t understand the basics of energy efficiency. We have already trained 200 workers in the first phase during 2015 and 2016, and are now rolling this out right across the country, starting in Galway next week. We are a little tired of hearing home builders say that they are too busy to upskill their workers. Sorry if you don’t have time to upskill, perhaps you should’nt be building homes. Register here for Foundation Energy Skills. Any construction workers completing the Foundation energy skills are eligible to be entered on the Construction Workers Skills Register. We want all the trades to get on a path to continual up skilling. After all you deserve the best from your home, but home buyers you need to demand a quality product too.